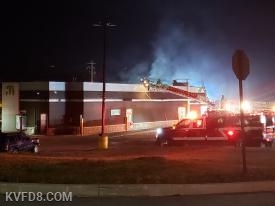 " Working Regionally to Survive Locally "
At 7:41 PM, KVFD, along with many surrounding departments, was dispatched to a reported garage fire in the first block of Amy Drive, West Sadsbury. Chief 52 arrived and advised that smoke was showing from a detached garage. Firefighters went into service and at 7:49 PM Chief 52 reported the fire was out. The homeowner extinguished it with a garden house. Firefighters were working to ventilate. 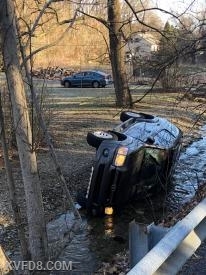 This morning at 8:30 AM, KVFD was dispatched to a crash, a vehicle off the road into a creek with the driver reportedly having a head injury. Chief 8, Amb 8-2, FM-45, and Rescue 8 responded and assisted with traffic control and hazards. The driver was already out of the vehicle - no extrication was necessary. KVFD has four members in the US Army. All are assigned to infantry units. On Thursday, Deputy Chief Josh Schreiber leaves on a year-long deployment as part of the Army's Battle Group Poland. Josh is a Sgt. (E-5) calvary scout and team leader with the PA Army National Guard. His unit, the 56th Stryker Brigade Combat Team 3278 CAV, has been assigned a one year tour of duty there as part of a NATO mission. 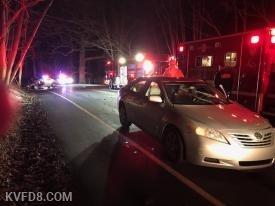 At 6:08 AM, KVFD responded to Swan Road north of Church Road in West Sadsbury Township for an accident with entrapment. The caller reported it involved a car into the bridge. Res 8, Amb 8-1, Medic 93 and FP8 responded and firefighters extricated the patient after removing a door and roof. He was transported to a hospital for treatment. The PA State Police are investigating and Null’s Towing assisted. 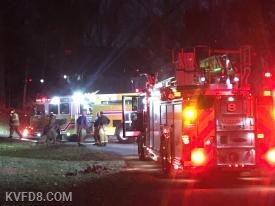 On Sunday, February 24, 2019, at 8:22 PM, KVFD was dispatched to an accident on Rt. #10, Limestone Road between Old Race Track Road and Boro Line Road in Highland Township. Amb 8-1 arrived and reported that there were three vehicles involved with one person entrapped. Early this morning, at 12:59 AM, KVFD was dispatched on a mutual aid assignment to assist the Honey Brook Fire Company at a barn fire on Beaver Dam Road. Initial reports had over 60 dairy cows in the barn. 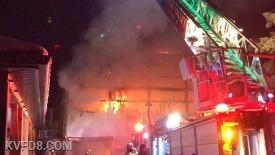 Ladder 8 initially responded with Tanker 8 and Squad 8 soon following. Ladder 8 at this morning's barn fire. "Working Regionally to Survive Locally"
The Keystone Valley Fire Department was formed in March 2013 with the consolidation of the Parkesburg, Pomeroy and Atglen Fire Companies. Station # 8 provides Fire/Rescue & EMS Services to Parkesburg Borough, West Sadsbury Township, Sadsbury Township and Highland Township. 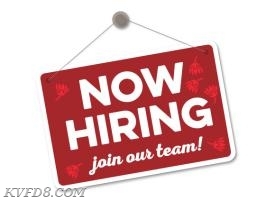 Please click on the Volunteer Section to learn how to become a member of the KVFD family!